Basically, it's a two round granny square with a partial third round of two triple crochet shells. wow! i hope i get good enough to make a bunch of those. i could put them together for a blanket for my little girl. I've made a few to use as coasters for coffee cups, so if you want to try it without committing to making a blanket (which would be adorable, by the way), that's an easy and low-commitment way. Thank you for this! 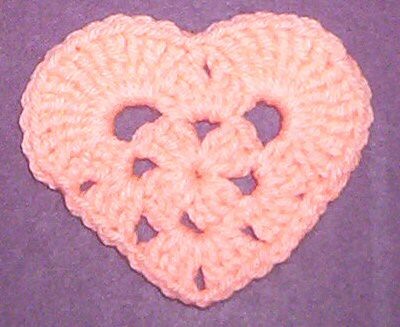 I'm doing hearts for my cousins for Valentine's Day, and as I was looking at the pattern, I realized this could be great for making 4-leaf clovers as well. Just make 4 shells instead of 2 in the last round. Oh, that's a great idea. And it's making me wonder what other things I could do with that basic pattern. More stuff to swatch on knitting circle night!